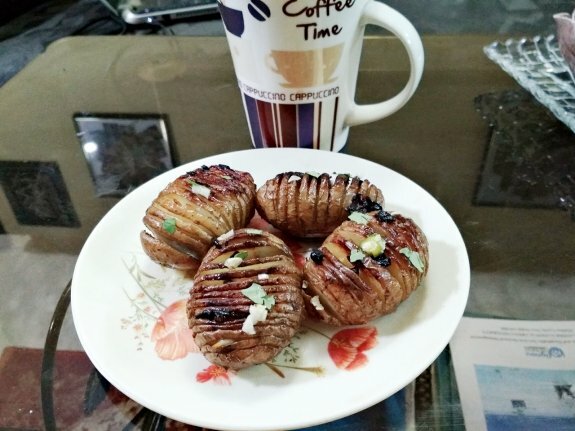 Lemon Herb Baked Jacket Potato is absolutely delightful and one of the healthier preparations we can have. You can easily make this recipe in your micro-oven by adding some olive oil, melted butter, honey, garlic, lemon juice and herb. Honey will give a great essence to the savory taste baked potato and also make the potatoes so much more delicious. 1. Slice each potato horizontally like hasselback potatoes (without cutting the whole potatoes) so that the potatoes get the amazing flavours of herb and lemon. Every slice of the potatoes will be coated with garlicky and olive oil or buttery flavour. 2. Now, take a small bowl and add olive oil, lemon juice, and melted butter, garlic chopped, green chillies chopped, salt, honey and herb and mix everything well. 3. Now, take a baking tray for your microwave and add some oil and butter into it. Place the potatoes on the baking tray and pour the olive oil infused herbs on the potatoes carefully by using a spoon so that every slice can be coated with the oil mixture. 4. Preheat the oven. Now, add the baking tray on the oven and bake it for 20-30 minutes or less or more at 250 degree Celsius. Check the potatoes in between so that the potatoes are not overcooked. 5. Take a tooth pick and push on to the potatoes. If it smoothly goes in, then your potatoes are cooked properly. 6. Serve these micro-oven cooked potatoes hot to make your snack time a memorable one.